will turn your little puppy's cuteness factor WAY UP, plus it's tons of fun for both of you! Of course all these tricks also work with older dogs, but they are especially fun to do with energetic puppies. The key to teaching these dog tricks effectively is PATIENCE, PERSISTENCE and of course tons of PRAISE! Below are three cool puppy tricks with easy step-by-step instructions. Try them all and then let us know about your results! Does YOUR Maltese puppy do tricks? Show us a video of your Maltese puppy performing tricks & your dog could be famous! Dancing is a really fun dog trick to teach your Maltese puppy. It works best with puppies that already like to jump up on people (which includes most puppies I know). I taught my Maltese Poodle mix Disco to dance soon after we rescued him and that is how he got his name. This trick is perfect for small dogs like Maltese puppies because they are able to balance better than larger dogs. Once you teach him this trick, you can tell your puppy to dance with people instead of jumping up on them. When your puppy is excited and jumping around you, tell him to "dance!" while gently holding his front legs and lifting them up so that he stands on his hind legs. Praise him, give him a treat, and gently put him back on the ground. Once he knows how to do this, you can see if he can do it without your help. Soon your Maltese puppy will be just like my Disco and hop around like a little white bunny whenever anyone says "dance!" This is a classic dog trick and so easy any puppy will be able to pull it off (yes, even your stubborn little one!) It's also fun to learn and really cute once your Maltese puppy gets the hang of it. I always have both of my dogs sit and shake for treats as it teaches them good manners. The easiest way to teach your Maltese puppy to sit on command is to have a treat (my dogs LOVE Beggin Strips) on your hand, lift it up above your puppy's nose and say "sit!" 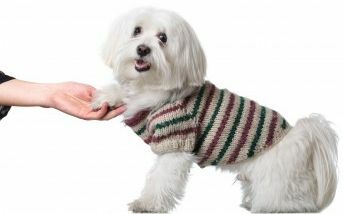 If your Maltese is standing and tries to grab the treat, don't let him get it, but repeat the same maneuver again. When he sits, immediately give him the treat and praise him. Repeat the trick a few times. Once your puppy has learned to sit on command, you can teach him to "shake hands". Give him the command ("say hello!" or "shake! "), gently hold his paw with your hand, and give him a treat with the other hand. Repeat this a couple of times. Most Maltese puppies are very smart and learn this pretty fast, if your timing (the command + the praise and treat) is right. This is a little more of an advanced dog trick, but it's great for obedience and a fun dog trick to show off to friends. My Maltese dog Marley is an expert at it, but my Maltipoo Disco... not so much. Hold a toy or treat in front of you, in the palm of your hand. When your puppy reaches for the object, close your hand, pull it away and say, "leave it!" Repeat this step until your puppy stops reaching for the object. Then, place the object on the floor. If your Maltese reaches for it, cover it with your foot or hand. When your Maltese puppy consistently leaves the the toy or treat alone, say "leave it!" just before you show him the object. As soon as he backs off, praise him and say, "leave it!" Does your Maltese puppy do tricks? If so, your puppy could be famous! We want to see a video of your Maltese puppy performing a trick. To include a video of your Maltese puppy doing tricks, upload a video to YouTube, click the "Share" button, then click the "Embed" button and copy and paste the entire "Embed" code from the YouTube page. Please tell us step by step how you got your Maltese puppy to do this trick. Was it hard or easy? How long did it take? Let other Maltese Maniacs know how they can get their puppy to perform the same trick(s). 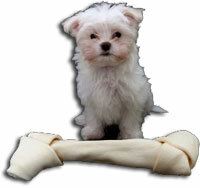 See videos of other Maltese puppies performing some cool puppy tricks. Find out everything you need to know about Maltese puppies.